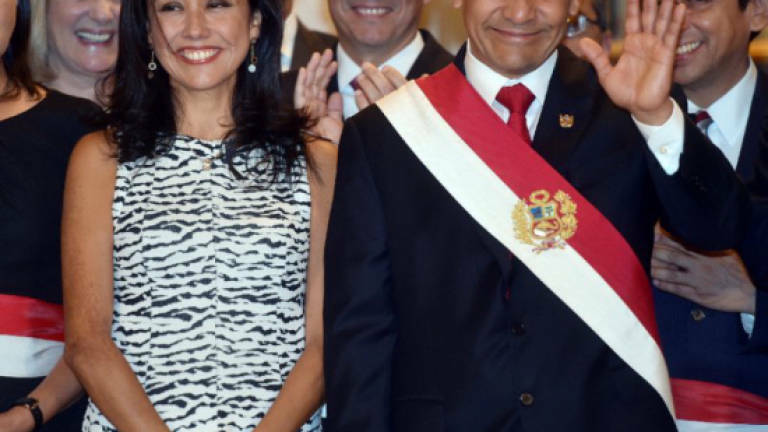 28 Apr 2018 / 13:29 H.
LIMA: Bureaucratic delays on Friday held up the release from preventative detention of Peruvian ex-president Ollanta Humala and his wife, one day after the Constitutional Court said they can remain free while they await their corruption trial. Humala, Peru's president from 2011 to 2016, protested via Twitter. Starting Friday he said that he and his wife Nadine Herrera were being "illegally deprived of our freedom", he wrote. "We should already be with our children," he wrote, adding that Thursday's court ruling "must be complied with immediately, not in four days". Humala and his wife will probably remain in custody until Monday, a lawyer for the couple earlier told AFP. "This is absurd," said attorney Wilfredo Pedraza, noting that the court ruling "orders immediate freedom" for both of his clients. The pair has been in prison since July awaiting trial on charges of money laundering. They allegedly received millions of dollars in illegal campaign donations from Brazilian construction giant Odebrecht ahead of the 2011 election. In February 2017, Jorge Barata, Odebrecht's former Peru chief, told prosecutors he gave Humala US$3 million, (RM11 million) in cash at the request of former Brazilian president Luiz Inacio Lula da Silva, who was himself jailed for corruption earlier this month. Several months later, Peruvian judge Richard Concepcion Carhuancho ordered that the couple be held in pre-trial detention on grounds there was a "high probability" they would try to evade justice. Humala is being held at a police station east of Lima, while his wife is being held at the women's prison south of the capital. Humala is one of four former Peruvian heads of the state caught up in the vast Odebrecht corruption scandal that has engulfed Latin America — although he is the only one who had been jailed so far. The other three also implicated in the scandal are Pedro Pablo Kuczynski (2016-2018), Alan Garcia (2006-2011), and Alejandro Toledo (2001-2006), who is currently in the United States fighting off Peruvian efforts to have him extradited.